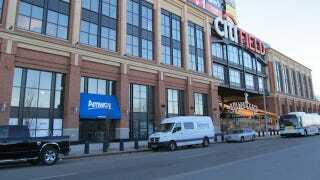 The Citi Field outpost is Amway's first storefront in America. On Saturday, Amway staged a grand opening (or "grand opening": it got no coverage, as far as I can tell) with the Amway sign just a few feet away from a Mets ticket booth. Amway is a multilevel marketing opportunity, to use the euphemism, or a pyramid scheme, to use the terminology of its critics. Individuals sign up as "Independent Business Owners", or I.B.O.s, to sell an array of Amway products, buying them up front while simultaneously recruiting others to join Amway as well. You know what isn't a good look? An MLB franchise that was bankrupted by a Ponzi scheme entering into a partnership with a company that recently paid $150 million in settlement money to the victims of its pyramid scheme. This is almost as bad as the time the Mets welcomed the shyster from 1-800 Flowers as a minority owner. One Of The Mets&apos; New Minority Owners Has Been Accused Of Consumer Fraud. He&apos;ll Fit Right In. Get excited, Mets fans. Once you're finished supporting a shoddily run organization by attending a Mets game, you can swing by the Amway store and support a fraudulent one as well.